Background: In preschool children, attacks of wheeze are usually triggered by viral colds. The inflammatory substrate in preschool viral wheeze (PVW) is unclear, but epidemiological data suggest that most PVW is not caused by allergic inflammation. We therefore speculated that the neutrophils are an important effector cell. Systemic neutrophil activation is the first stage for the development of pulmonary neutrophilia. Markers of neutrophil activation are shedding of the adhesion molecule L-selectin from the cell surface, upregulation of Mac-1 expression, and an increase in serum soluble L-selectin. Aims: To obtain evidence for systemic neutrophil activation during PVW. Methods: Preschool children (1–5 years) admitted to hospital with acute PVW (n = 20) and normal controls (n = 18) were studied. Adhesion molecule expression on CD16 positive neutrophils was determined in both groups and expressed as molecules of equivalent fluorochrome (MEF). Serum soluble L-selectin was analysed by ELISA. Results: Compared with controls, children with PVW had reduced neutrophil L-selectin expression (median MEF (IQR): 69 (11 to 96) units versus 136 (109 to 163) units, p < 0.001) and higher serum soluble L-selectin (2.8 (2.3 to 3.1) versus 2.4 (2.2 to 2.6) μg/ml, p = 0.04). There was no significant difference in neutrophil Mac-1 expression. Conclusion: Systemic neutrophil activation is associated with acute PVW. Recent studies have focused attention on the role of non-eosinophilic mechanisms in the pathogenesis of attacks of atopic asthma triggered by colds. For example, neutrophils predominate in the sputum of asthmatic adults with colds,1 and increased levels of interleukin 8, a potent neutrophil chemoattractant, are present in the lower airway of children with viral triggered deterioration of atopic asthma.2 Viral colds are also an important trigger of wheeze in preschool children (preschool viral wheeze, PVW), since an upper respiratory tract virus can be isolated in more than 80% of preschool children presenting to hospital with acute wheeze.3 Despite the common trigger factor, epidemiological studies suggest that PVW is a phenotype that is separate from atopic asthma. First, 60% of children with PVW are asymptomatic by 6 years of age.4 Second, these “transient” wheezers do not have the normal risk factors for atopic sensitisation.4 We have therefore previously speculated that pulmonary inflammation in PVW is different from chronic atopic asthma.5 Indeed there are preliminary data to support a role for non-eosinophilic inflammation in PVW. Margeut and colleagues6 performed bronchoalveolar lavage (BAL) in a highly selected population of children with a history of severe PVW. While no increase in airway eosinophils was found, this group had an increased percentage of neutrophils in the BAL fluid. In this study, we sought to determine whether systemic neutrophil activation occurs in PVW by measuring L-selectin and Mac-1 on systemic neutrophils, and serum sL-selectin in children admitted to hospital with PVW. Data were compared to a group of normal controls undergoing elective surgery. Acute PWV was defined clinically as: (1) an episode of physician diagnosed wheeze occurring in a child aged 1–5 years; (2) a clear symptom history from the parents of a viral cold in the 48 hours preceding the wheeze attack, with clinical rhinitis on admission; and (3) requiring admission to the Children’s Hospital, University Hospitals of Leicester NHS Trust. Exclusion criteria were: (1) premature birth; (2) a clinical diagnosis of bacterial infection; (3) any other chronic respiratory pathology; and (4) admission for >24 hours. Controls were recruited from children undergoing elective ear nose and throat surgery, or ophthalmic surgery. Children were excluded as controls if they had: (1) a chronic respiratory disease; (2) wheezed in the past 12 months; (3) active allergic disease; or (4) symptoms of an acute infection in the preceding week. Blood samples from children with PVW were obtained after topical anaesthesia, and samples from controls were obtained immediately after induction of general anaesthesia. PVW was treated with a single oral dose of prednisolone and “as required” nebulised salbutamol. The study required written parental consent and was approved by the Leicestershire Health Research Ethics Committee. One ml venous blood sample was collected into an EDTA bottle within five minutes, and transported on ice for flow cytometry. One ml of blood was allowed to clot at room temperature for 60 minutes; the serum was separated by centrifugation before storage at −70°C for analysis of sL-selectin. A full blood count was done on a 0.5 ml heparinised sample using routine hospital techniques. Flow cytometry was conducted within 30 minutes of sample collection. The antibodies used were fluorescein isothiocyanate (FITC) conjugated monoclonal anti-CD16, phycoerythrin (PE) conjugated anti-CD 62L (L-selectin), and PE conjugated anti-CD11b (Mac-1) (Becton, Dickinson and Company, Oxford, UK). Isotype matched antibodies, PE conjugated IgG2a and FITC conjugated IgG1 (Becton, Dickinson and Company, Oxford, UK) were used as controls. A 50 μl aliquot each of EDTA blood was added to three tubes placed at 4°C, which already contained either control antibodies or anti-CD16 and anti-CD62L or anti-CD16 and anti-CD11b. After incubation for 10 minutes at 4°C, 1 ml of 0.8% ammonium chloride was added to lyse red cells and the samples were transferred to 37°C. Flow cytometry was performed on the samples 10 minutes later (Ortho Cytoron-Absolute, Orthodiagnostic Systems, USA). The extent of the background non-specific fluorescence, as defined by the control antibodies, was restricted to less than 1% of the total events acquired. Discrimination frames were placed around the granulocyte cluster, which was identified based on their forward and side scatter characteristics. Neutrophils within this cluster was identified by CD16 positivity.12 The expression of CD62L and CD11b of at least 5000 events within the neutrophil population was then recorded. The mean fluorescence intensity of the gated cell population was obtained as channel numbers and was transformed to molecules of equivalent fluorochrome (MEF) using fluorescent beads (DAKO Flourospheres, Dako A/S, Denmark) according to the manufacturer’s guidelines. Serum levels of sL-selectin was analysed by ELISA according to the manufacturer’s instructions (Bender Med Systems, Vienna, Austria). Briefly, serum samples were diluted 1/200, and the assay was performed in duplicate. The lower limit for sL-selectin detection was 0.3 ng/ml and the manufacturer’s overall intra-assay coefficient variation was 3.7%. Data are summarised as median and interquartile range (IQR), and compared using the Mann-Whitney U test. Correlations were determined by Spearman rank correlation. Analysis was performed using a package for microcomputers (SPSS for Windows, version 10, SPSS Inc., Chicago, IL). Statistical significance was defined as a p value <0.05. Twenty children (12 boys, 8 girls) with acute viral wheeze and 18 controls (12 boys, 6 girls) were studied. Controls underwent a variety of surgical procedures, including tonsillectomy and adenoidectomy (n = 6), insertion of grommets (n = 7), bronchoscopy (normal) (n = 2), squint (n = 1), and other (n = 2). Compared with controls, children with PVW were slightly younger (median 32 (IQR 18 to 47) months versus 54 (26 to 63) months, p = 0.04). Seventeen (85%) children with PVW had previous attacks with no interval symptoms (median number: 2.0). Three children with PVW had a history of either mild nocturnal cough or wheeze between attacks. In the subgroup where blood neutrophil numbers were measured, the majority of children with PVW and controls were within the normal range (1–8.5 × 109 neutrophils/l). However, the PVW group (n = 17) had a higher absolute neutrophil count (8 × 109/l (5 to 11) versus 4 × 109/l (3 to 5) p < 0.01), and increased percentage of CD16 positive neutrophils (99.5% (98.3 to 99.7) versus 97.1% (94.2 to 97.7), p < 0.001). Neutrophil L-selectin expression in PVW (n = 20) was significantly lower than controls (n = 18) (MEF: 69 (11 to 96) units versus 136 (109 to 163) units, p < 0.001; fig 1). There was no difference in Mac-1 expression between the two groups (MEF: 934 (722 to 1287) units versus 730 (571 to 1000) units; fig 2). 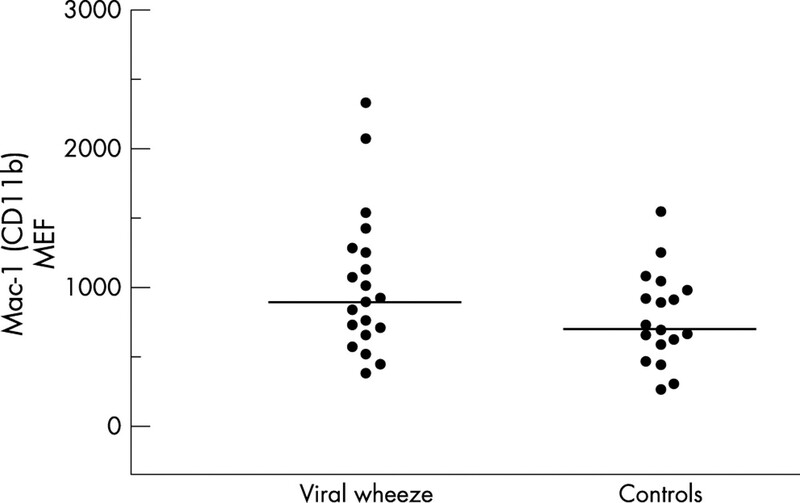 Neutrophil L-selectin expression was not associated with age in either viral wheeze or controls (NS by Spearman rank correlation). sL-selectin was detected in the sera of all children (PVW, n = 15; controls, n = 16), and was higher in PVW (2.8 (2.3 to 3.1) μg/ml versus 2.4 (2.2 to 2.6) μg/ml, p = 0.04; fig 3). There was no association between time from oral steroid therapy and L-selectin expression in the PVW group (NS, Spearman’s rank correlation). 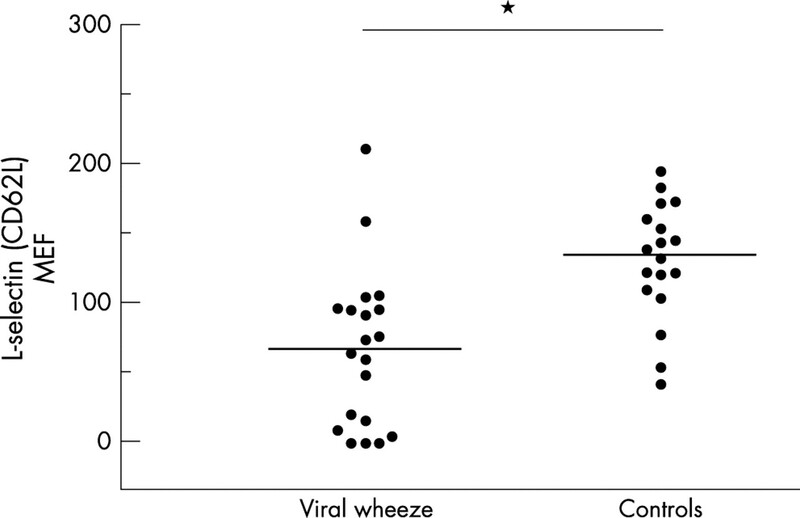 L-selectin (CD62L) expression on systemic neutrophils in acute preschool viral wheeze and controls. *p < 0.001, by Mann-Whitney U test. Bars represent medians. Mac-1 (CD11b) expression on systemic neutrophils in acute preschool viral wheeze and controls. There is no significant difference between the two groups by Mann-Whitney U test. Bars represent medians. 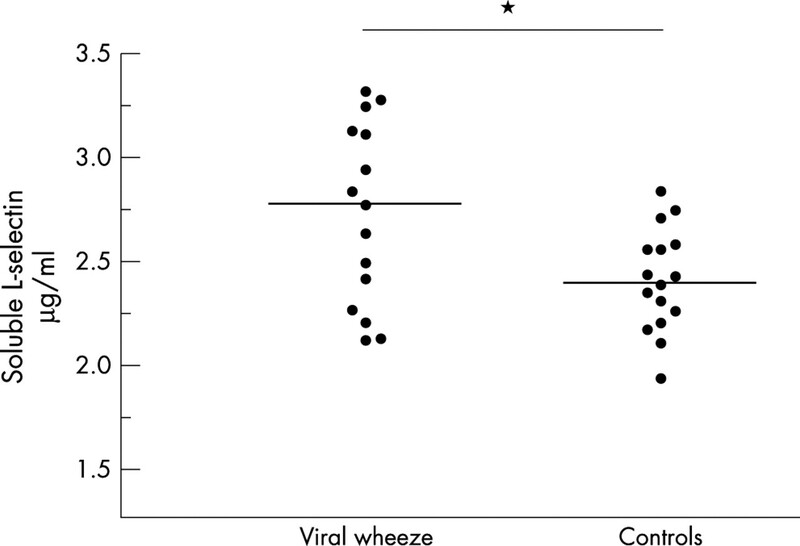 Serum soluble L-selectin in acute preschool viral wheeze and controls. *p = 0.04 by Mann-Whitney U test. Bars represent medians. Systemic neutrophil activation has not been studied during viral triggered wheeze in adults, and it is possible that the same changes in adhesion molecules occur in both viral triggered atopic asthma and PVW. However, previous studies have reported no association between systemic neutrophil activation and the clinical severity of atopic asthma. For example, in ‘t Veen and colleagues15 found no difference in neutrophil L-selectin expression between normal (non-atopic) controls and adults with either mild or severe atopic asthma. Furthermore, Oymar and Bjerknes16 compared serum sL-selectin in atopic asthmatic children with healthy controls, and found no increase in sL-selectin during an acute attack. Although the present study shows the first “activation” step in the development of pulmonary neutrophilia, we cannot directly implicate the neutrophil in the pathogenesis of PVW. This is because several confounders remain to be excluded. First, trivial symptoms associated with the common cold may be associated with a similar pattern of neutrophil activation. In a very small group of children with rhinovirus colds, we have previously reported the presence of BAL fluid neutrophilia,17 which may indicate that some neutrophil transmigration may occur during most trivial colds. We speculate that children with PVW have a propensity to recruit more neutrophils in their airways, and that neutrophil products trigger bronchoconstriction via activating other inflammatory cells, such as mast cells. Indeed, we have recently found evidence of leukotriene activation in a subgroup of children with PVW.18 To define further the relation between neutrophil activation and the development of bronchoconstriction in PVW, more data are needed on the extent of neutrophil activation during colds in normal children. A second potential confounder is the effect of steroids. Steroids decrease the expression of L-selectin on circulating neutrophils,19 an effect that occurs after a “lag phase” of eight hours. Decreased expression is not caused by shedding from the neutrophil surface, but the release of L-selectin “low” expressing neutrophils from bone marrow.20 Neutrophils are not activated by corticosteroids, and serum sL-selectin is therefore not increased.19 Since we found both increased sL-selectin in PVW, and reduced L-selectin expression on neutrophils from children with PVW sampled within three hours of oral steroids (n = 4, p = 0.01 versus controls, data not shown), it is unlikely that steroid therapy is a major confounder. A confounding effect of atopy is also unlikely since previous studies have found no affect of atopic sensitisation on neutrophil L-selectin expression or serum sL-selectin.15,16 There are no data on the effects of anaesthetic agents on paediatric neutrophil L-selectin expression. In the normal controls, the very short period from induction of anaesthesia to sampling should have minimised any effect. Some anaesthetic agents tend to activate neutrophils. For example, ketamine further decreases L-selectin expression when adult neutrophils are stimulated by fMLP in vitro.21 However, if anaesthesia had activated neutrophils in our control group, this would have reduced rather than increased the difference in L-selectin expression. In conclusion, acute PVW is associated with systemic neutrophil activation. Our data are compatible with a role for neutrophils in the pathogenesis of PVW. Norzila MZ, Fakes K, Henry RL, et al. Interleukin-8 secretion and neutrophil recruitment accompanies induced sputum eosinophil activation in children with acute asthma. Am J Respir Crit Care Med2000;161:769–74. Rakes GP, Arruda E, Ingram JM, et al. Rhinovirus and respiratory syncytial virus in wheezing children requiring emergency care. IgE and eosinophil analyses. Am J Respir Crit Care Med1999;159:785–90. Grigg J, Venge P. Inflammatory markers of outcome. Eur Respir J Suppl1996;21:16s–21s. Wang SZ, Smith PK, Lovejoy M, et al. Shedding of L-selectin and PECAM-1 and upregulation of Mac-1 and ICAM-1 on neutrophils in RSV bronchiolitis. Am J Physiol1998;275:L983–9. Schleiffenbaum B, Spertini O, Tedder TF. Soluble L-selectin is present in human plasma at high levels and retains functional activity. J Cell Biol1992;119:229–38. Russell KJ, McRedmond J, Mukherji N, et al. Neutrophil adhesion molecule surface expression and responsiveness in cystic fibrosis. Am J Respir Crit Care Med1998;157:756–61. Rabb H, Agosti SJ, Bittle PA, et al. Alterations in soluble and leukocyte surface L-selectin (CD 62L) in hemodialysis patients. J Am Soc Nephrol1995;6:1445–50. Ilton MK, Langton PE, Taylor ML, et al. Differential expression of neutrophil adhesion molecules during coronary artery surgery with cardiopulmonary bypass. J Thorac Cardiovasc Surg1999;118:930–7. Thurau AM, Schylz U, Wolf V, et al. Identification of eosinophils by flow cytometry. Cytometry1996;23:150–8. Spertini O, Schleiffenbaum B, White-Owen C, et al. ELISA for quantitation of L-selectin shed from leukocytes in vivo. J Immunol Methods1992;156:115–23. Davey PC, Zuzel M, Kamiguti AS, et al. Activation-dependent proteolytic degradation of polymorphonuclear CD11b. Br J Haematol2000;111:934–42. in ‘t Veen JC, Grootendorst DC, Bel EH, et al. CD11b and L-selectin expression on eosinophils and neutrophils in blood and induced sputum of patients with asthma compared with normal subjects. Clin Exp Allergy1998;28:606–15. Oymar K, Bjerknes R. Differential patterns of circulating adhesion molecules in children with bronchial asthma and acute bronchiolitis. Pediatr Allergy Immunol1998;9:73–9. Grigg J, Riedler J, Robertson CF. Bronchoalveolar lavage fluid cellularity and soluble intercellular adhesion molecule-1 in children with colds. Pediatr Pulmonol1999;28:109–16. Oommen A, Grigg J. Urinary leukotriene E4 in preschool children with acute clinical viral-wheeze. Eur Respir J2003;21:149–54. Jilma B, Voltmann J, Albinni S, et al. Dexamethasone down-regulates the expression of L-selectin on the surface of neutrophils and lymphocytes in humans. Clin Pharmacol Ther1997;62:562–8. Nakagawa M, Bondy GP, Waisman D, et al. The effect of glucocorticoids on the expression of L-selectin on polymorphonuclear leukocyte. Blood1999;93:2730–7. Weigand MA, Schmidt H, Zhao Q, et al. Ketamine modulates the stimulated adhesion molecule expression on human neutrophils in vitro. Anesth Analg2000;90:206–12.